At 2:24am Units from Libertytown, Winfield, New Windsor, Mt Airy, Sykesville and Woodsboro were dispatched to the 15600 Block of Barnes Road for a reported garage on fire. As units responded Frederick County Emergency Communications reported that the fire was impinging on a house that was only 20' away from the garage. 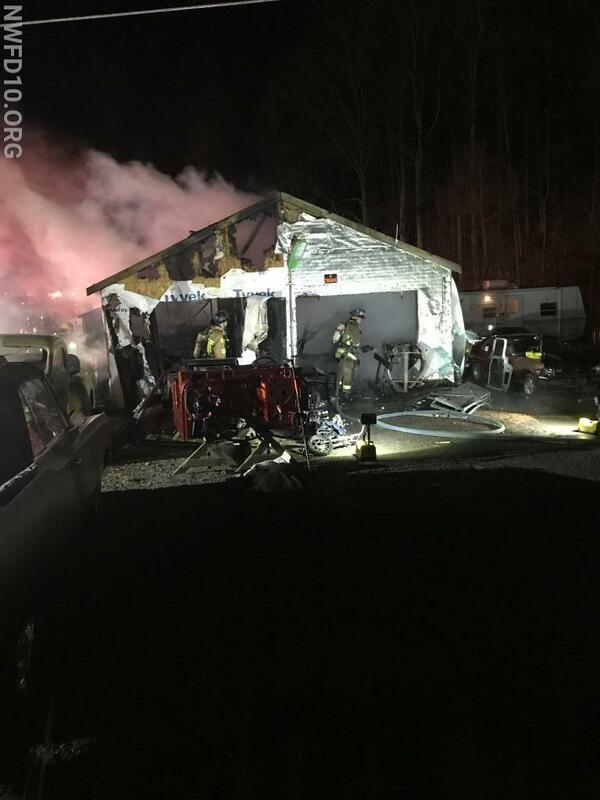 Frederick County FD100 arrived and found a 20' x 20' detatched garage with fire throughout as well as through the roof and established the Barnes Road Command. Engine 102 arrived and took the first due position, quickly stretching two attack lines to mount a defensive attack to get a quick hold on the fire. Personnel from Libertytown, Winfield and Sykesville assisted with knocking down the remaining fire an opening up the structure to ensure that all of the hot spots had been extinguished. The garage and its contents were a complete loss. E102 operated for 2 hours prior to returning to service. The cause of the fire was determined to be related to a wood burning stove in the garage.